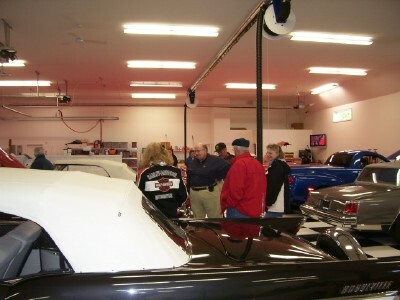 The May meeting, led by Bob Torbet, was held at Jack Putnam's. The treasurers report was given by Jack Putnam. We had a total of 14 members and guests present. Everyone was given a chance to introduce themselves. The big topic of the meeting was all of the upcoming events. Bob invited everyone to the shakedown tour at Indian Lake. Jack mentioned the Bluffton show on June 13th and the Backstreet event in Findlay on August 23rd. The club has committed to the Wapakaneta parade on Satruday, June 21st and the Forest parade on July 11th. Please plan to attend the parades if you have a running car. 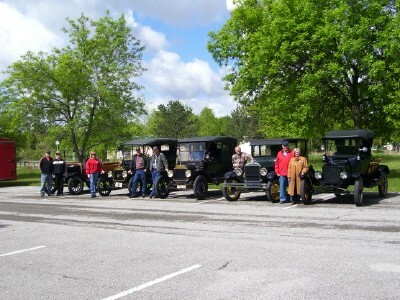 The club receives money if we have 5 cars at the Forest parade. Jack is planning a one-day-drive-to-dinner tour on the 29th. Come to the meeting to find out where and when. We may still go to Bruce's to check out the T's on the Richmond tour. A Lake Erie tour in the fall is still a possibility. We're trying to miss the busy season and still not freeze. Quadracycle pictures were shone. We had a somewhat successful demonstration on changing windshield glass. 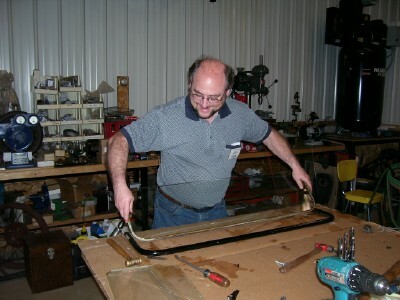 The old glass was removed, new glass installed, and stress crack created. Oooops!!!! The annual shakedown tour at Indian Lake was held on a Sunday in May. As you can see from the pictures, it was sunny and a bit on the cool side. This fact did not deter us in any way from making the trek around the lake. This years tour was well represented from the south. Bruce invited a couple of his friends to bring their T's along. Sorry, I missed Jack and Marilyn in this lineup of cars. classified as a home because it doesn't have any bedrooms. What it does have is a big ten position garage, two bathrooms, a library, a kitchen, a shoe storage room, and a game room. 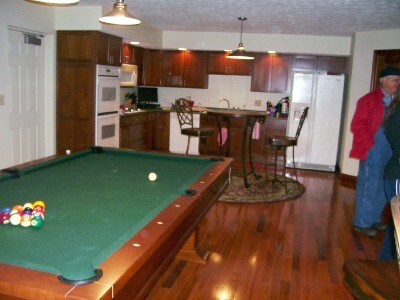 The building features a fully functional camera'd security system, flat screen TV, pool table, and much more. 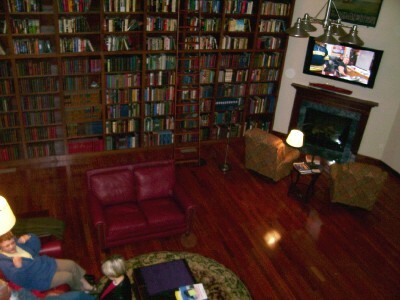 We spent some time here just looking around and relaxing The picture below shows the relaxing section of the library. From Timmerman's Fun Barn we continued around the lake, across the covered bridge, and finished with a late lunch at the Tiltin Hilton. It is always a treat to eat at this place. I just forget from year to year that the burgers are too big to get your mouth around. I guess that I should read this article next year to remind me this fact. To conclude, we all had a great time and all of the cars performed flawlessly, once the bendix let go. tension between the glass and frame because, within a five minute period, a crack had appeared and inched its way from onc corner of the glass to the other. It has been replaced. Here we see Dave Nolting giving a seminar on relaxation techniques. We had a long day of driving up to this point. Dave led the tour in the morning and I led up to this point in the afternoon. Dave's brother drove the Depot Hack to the tour from Ashley, used it for the tour, and drove the touring car on the far right for the trip back home. 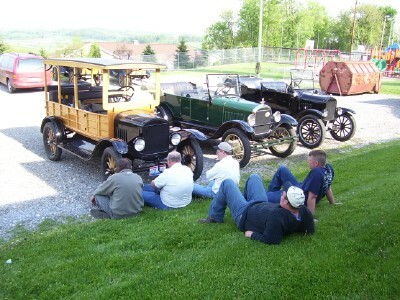 All of this on his first real weekend of driving Model T's. He had his hands full. That's Dave in the middle, his brother to his left, Brent Mize to the right, Ben Nolting behind dave, and Ben's buddy. Other Northwest Ohio members on the tour were Jack & Marilyn Putnam, Bob Torbet, and Jim & Sue Cook. This is one of those things that you've heard about happening, but never seen. Sue and I had the privilege of watching from behind, as the wheel came off of this touring and ran down the road beside it before crossing to the fence across the road. We had the old rim off and the new tire on within five minutes, as thunder rumbled in the background. Its a good thing that it had demountibles and a spare. I can't imagine doing this with non-demountible clinchers. He drove about 75 yards on the rim without even a sign of damage. This car will be at the June meeting; so, come on down and bring some friends. 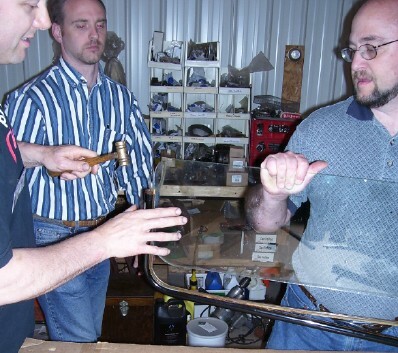 Joe Bell is also planning on bringing some rods for a show and tell. Just some of the things that he's come across in hit rebuilding. This is the 1926 Cretors Popcorn Truck mounted on a 1925 TT chassis that spent its entire life in the Cabridge NY area. I spent every last spare moment last winter getting it operational. Last weekend was its second public outing when we popped and sold about 400 bags of popcorn at the Saratoga Auto Museum's annual car show. It had been out of service for 10 years when the museum acquired it last summer. It took me two hours of checking before I started it up and drove it for an hour. Then the entire steam plant was removed piece by piece to clean, repair, and test. The poppers and drive machinery were next. The biggest challenge was figuring out how to convert it to propane. It was originally fired with two very hazardous chemicals mixed 50/50 ... heptane and pentane. They are no longer available without a license. Finding an LP regulator that would allow more than the ususal 1psi of pressure was not easy. I finally found one in Texas that will allow up to 60psi, we typically run at 15psi now. The conversion was done in such a way that absolutely no modifications were necessary to all the original equipment except increasing the orifice sizes.